Glucomannan is a natural, water-soluble dietary fiber extracted from the roots of the elephant yam, also known as konjac. 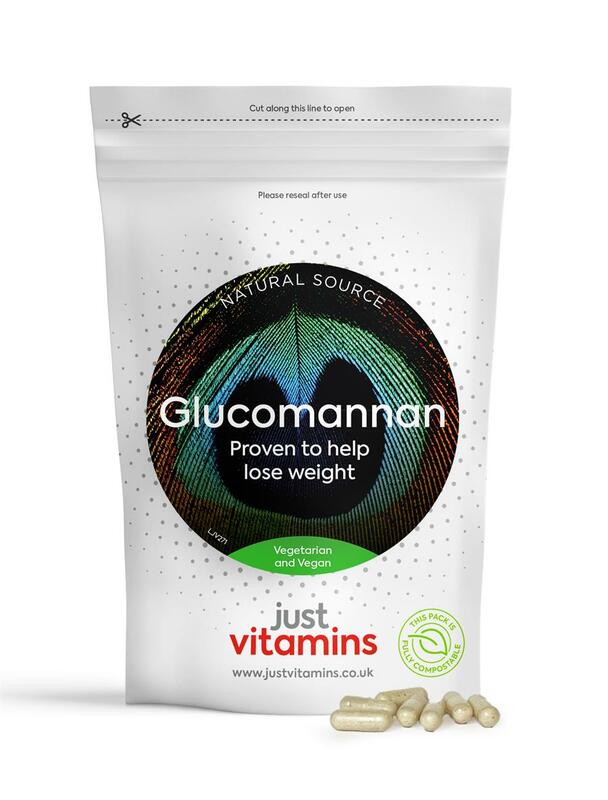 Glucomannan has been proven to contribute to weight-loss as part of an energy-restricted diet. It has a very low calorie content. It takes up space in the stomach and promotes a feeling of fullness (satiety), reducing food intake at a subsequent meal. What is unique about glucomannan? Glucomannan absorbs so much liquid that if you empty a capsule into a small glass of water, the entire thing turns into a gel. Because of this, it is important to take capsules with a full glass of water to safely and naturally assist weight loss. In addition to being sold as a dietary supplement, it is used as a food additive, specifically as an emulsifier and thickener denoted as E425. It is a common ingredient in foods such as pasta, noodles and tofu. Our supplement is made using 95% glucomannan extract - many competitors don't even declare their content and can use different fillers instead. Two capsules provide 1g of Glucomannan. A daily intake of 3 g of Glucomannan in three doses of 1 g each, together with 1-2 glasses of water before meals and in the context of an energy-restricted diet contributes to weight loss. Swallow with plenty of water to ensure the Glucomannan powder reaches your stomach.Take extra care if you usually have difficulty swallowing capsules. Konjac Root Powder (95% Glucomannan), Hydroxypropylmethyl Cellulose, Stearic Acid. Adults: Swallow two capsules before each of your three daily meals. Swallow with 1-2 glasses of water and take extra care if you usually have difficulty swallowing capsules.